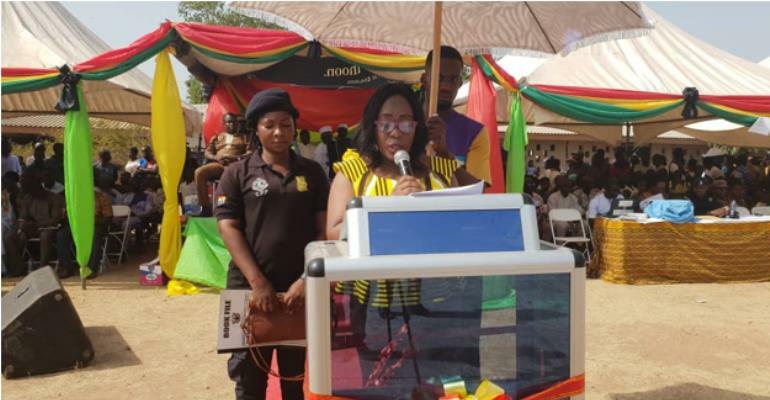 The District Chief Executive (DCE) for Tain, Madam Charity Akua Foriwaa Dwommoh, has advised the youth in the Tain district to avoid any kind of violence that would divide them in order to consolidate the peaceful atmosphere the country is currently enjoying. According to the DCE, the country over the years have suffered long periods of blatant and shameful abuses which have so destroyed our ranks and planted a seed of discourse among us for which we are all yearning for wholesome change for the better. ‘Let’s not forget that before political parties were formed, we co-existed in a peaceful environment as a united body’, she said. The DCE said the country’s political discourse for some time now has been characterized by the use of intemperate language and the basic virtues of truthfulness, honesty, forgiveness, and togetherness have been rapidly disappearing from our various communities. She stated that the future of the country depends on the youth and if the country can achieve any worthwhile results by making the future national trend, we must take positive steps to inculcate in the minds of the youth the need to abide by rule of law, which according to her is the only way we can envisage the continuity of harmony within the country. She gave the assurance that the government remains committed to the view that our peace and unity constitute the bedrock of the new democracy we seek to build, therefore leaving no stone unturned in the quest to keep a society devoid of insecurity. The DCE appealed to the youth to go through education and skill acquisition which are pre-requisite for national development rather than engaging in violent activities and called on all Ghanaians to protect our natural resources.